I'm so excited about this and hope it works. If any of you drop by and want to help the kids out in the comments, please feel free. (They haven't done anything yet as of this posting.) If you want to make suggestions to me about setting it up/layout/etc, please comment HERE. Mad props to the trailblazer. I struggle, daily, with this (somewhat internal, somewhat not) dialog. Er, monologue. "Stop talking!" "Wait, I mean talk to each other!" "But about math!" "Oh, forget it, stop talking!" Really, my students talk, quite a bit. About math. In fact, trying to squash all talking seems to promote the off-task talking. But I still have to work to make it happen. It's not always organic, per se, to my lessons. There is a 75% chance of rain on any given day in the next week. What is the probability that it will rain on at least 5 of the 7 days? Update (also in comments): The weird thing, that you might notice in the course of solving, if you calculate P(5), P(6), and P(7) separately and then add them together, is that P(5) and P(6) come out to the same thing. The probability it will rain 5 out of the 7 days is the SAME as the probability it will rain 6 out of the 7 days. Isn't that weird? If you write it out with fractions and the nCr formula you can how it happens, but the result is still counterintuitive to me. Combinations sometimes surprise me like that. 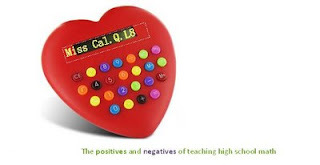 Miss Calcul8 hasn't started a full-time teaching job yet, but she's already an experienced blogger and routinely offering sage reflections and observations from substitute teaching. I was very happy to contribute a guest post, and as a bonus, I really like what I wrote. Head over there and check it out, and don't leave without adding her to your reader. This is a summative assessment for the Algebra 1 Statistics unit. (I know that one-variable statistics is not algebra...insert grumbling about overloaded curriculum here.) The students are expected to be able to solve problems involving measures of central tendency, construct/interpret a box and whisker plot, construct/interpret a frequency table, frequency histogram and cumulative frequency histogram, and construct/interpret a circle graph. While learning the unit they practice constructing the graphs by hand. For the project, I teach them how to construct them with a computer and calculator and expect them to do so. The whole evolution takes 4-5 days of class time. On the first day, we just collect data. Every student answers 24 questions. The questions are divided into 8 sections (A-H), consisting of 1 each of qualitative data ("What is your favorite color? "), integer quantities ("How many first cousins do you have? "), and non-integer quantities ("How long is your shoe in centimeters?"). I collect their work and, overnight, separate the 10 sections. The next day, each group of students gets everyone's responses to a section of three questions. I give them explicit instructions about what graphs to create for each data set. We discuss why some graphs are more appropriate for different kinds of data, but if I let them pick, they would try to make a circle graph (or a "bar graph", which is not even an option) for everything. Two to three days are spent with the computers, calculators, poster board, etc, creating graphs, and writing up responses to analysis prompts. On the final day, each group presents their findings to the class. There are some things I would change if I could. If I had a month for this unit, instead of 10 instruction days, I would want them to decide what data to collect, and give them a long period of time to do so. I would explore numerous ways to display data in informative and enlightening ways, and let them try whatever type of infographic they desired. As it is, I have 10 days to get them conversant with four specific types of graphs. So I make that process as engaging as I can. Go here for Data Collection Sheets, Writing Prompts, Technology Instructions, and Scoring Rubric. Edit: I only made it about 7 hours without commenting. Everything I have to say is in the comments. Let's move on, shall we? This post grew from a comment I was going to write on my post Pi Whats, but as the comment grew and grew I felt it deserved its own post. It's about measurement and precision, and how whether you think they matter in mathematics depends on your perspective. Do you think a string can be pi inches long? Do you think a string can be 1 inch long? I mean EXACTLY 1 inch long? If your answer is yes, a string can be exactly 1 inch long, then you automatically think it can be exactly pi inches long. Get a sphere whose diameter is exactly one inch, wrap the string around its circumference one time and cut it the exact length of the circumference, and the string is exactly pi inches long. If you are going to try to argue with me on this particular conclusion, then you are wrong. Pi is not some ill-defined Mysterioso of a number. It's very precisely defined. It's the circumference of any circle divided by its diameter. It's the circumference (in u units) of a circle whose diameter is 1 u. If your answer is no, a string can't be exactly 1 inch long, then I'm okay with you saying it can't be exactly pi inches long, either. The larger philosophical concept is that mathematics deals with ideal, perfect, abstract constructs that can really only exist in our minds. I can imagine a line segment of unit length. Cutting a physical piece of string with scissors to be exactly 1 inch long is much more treacherous terrain. Scientists understand this, that's why they invented significant figures, and their calculations incorporate expected percent error. Whenever you measure something, you are necessarily rounding your measurement to the nearest level of precision on your measuring device. If you use a metric ruler with millimeter markings, and you measure something and say it's 2.6 centimeters, that means the thing you measured was closest to the marking at 2.6. It could be anywhere from 2.55 to 2.65 centimeters long. But in math we don't often discuss these problems of measurement. Because in math we deal in abstract perfection that can really only exist in our minds. We don't stop every time we give a measurement in a math problem and talk about the imprecision inherent in measuring something. In the physical realm there is no perfect square. No perfect right angle. No perfect circle. No length that is the square root of 2. But in my mind, the string can be exactly one inch long because I say so. These things can exist in our imaginations. In my mind, I can picture a square with sides of unit length, and draw in a diagonal, and I have created a length that is exactly the square root of two. In my mind, I can reason that somewhere between a string that is clearly less than one inch long and a string that is clearly greater than one inch long, there is a place I could theoretically cut that would be exactly one inch long. So as a mathematician, I say the string can be one inch long. Close your eyes and imagine a perfect wooden cube. Now saw this cube three times, along each of its three axes. Question: did you see sawdust? If so, you're no mathematician.